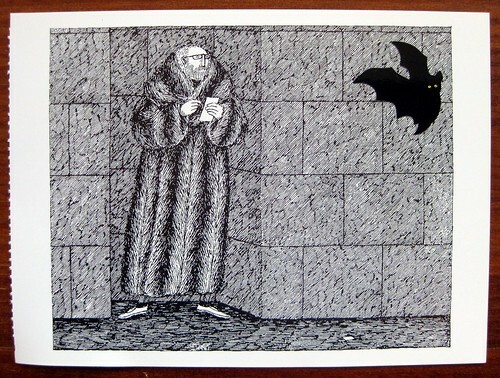 The Missive Maven: Happy Birthday, Edward Gorey! Wishing Edward Gorey happy birthday is a posthumous endeavor, since he died in 2000, but today is Edward Gorey's birthday, so I have to do a post about it! A dear friend gave me a 2011 Edward Gorey calendar, which is hanging above my writing desk, so of course the Gorey calendar notes Gorey's birthday. For a Gorey extravaganza, here's a link to all of my Edward Gorey posts. And happy birthday to Ogdred Weary too! I am honored to share a birthday with such a creative man! Haha, I figured as much! Also, sorry to be spamming this post, but, I just received my membership package from LWA today! Can't wait to look at the downloads and members' section! Not spamming at all, Eliza - getting a package from the LWA is something to be excited about! They are a fine organization and I support them wholeheartedly. Enjoy your package and membership!